Alt-N Technologies, BackupAssist, MailStore….they were all there. And that’s not all, we were even fortunate enough to bag a couple of inspirational guest victims speakers! 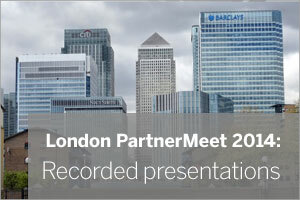 Yes, just in case you’ve missed us shouting about it every five minutes, last month was our “PartnerMeet” event in Canary Wharf. As you’ve probably gathered, we don’t do these that often (as often as we should!) and we were thrilled with the way it went, not least because of the great presentations made by the speakers we’d lined up for the day. If you weren’t able to make it along then a) forever hold your head in shame and b) do not fear, we planned for this and took the liberty of booking a film crew to capture the lot. Enjoy footage in glorious HD of each and every presentation on the day…. 3) The IT Marketing Agency – Marketing. Common Sense or Voodoo? Hope you found those useful – please don’t forget to subscribe to our YouTube channel for more great videos!